The rainy season has come in Japan. We can’t part with umbrellas. 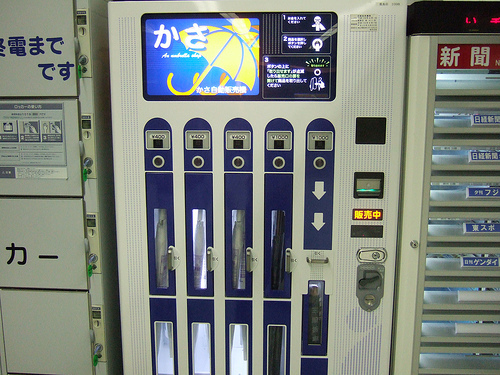 Sometimes we buy plastic umbrellas to protect against unexpected rain at convenience stores, supermarkets, and from vending machines (photo above). As you can see in the picture below, one out of four to five people uses clear plastic umbrella. Because plastic umbrellas are almost identical, they are easily mixed up in public umbrella stands and taken by someone besides the owner. Many people, however, buy plastic umbrellas on the premise that they would be stolen. 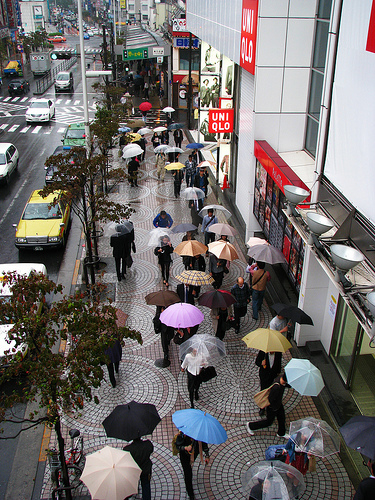 A plastic umbrella only costs a couple of hundreds yen, so it is not big deal to buy another one. If you don’t want your plastic umbrella to be stolen, you might want to try the following measures. Take your umbrella with you when you enter a building. Umbrella bags with handles or straps are available in stores. 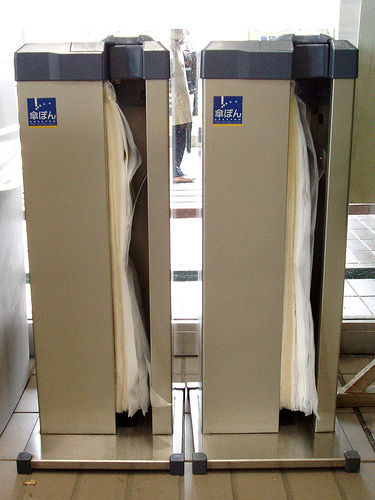 Plastic bags for umbrellas are often provided at entrances of buildings (photo below). Before you leave your umbrella in a stand, bind the tip with rubber band or hair band so it won’t easily open. It discourages the person who tries to use your umbrella. Affix a colored sticker and make your umbrella look different from others.